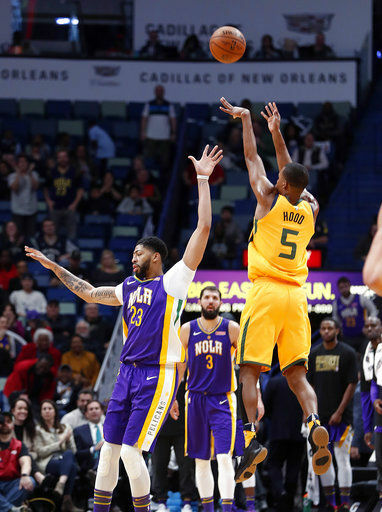 NEW ORLEANS (AP) — Rodney Hood scored 30 points in his second game back from a lower leg bruise and the surging Utah Jazz extended their winning streak to six with a 133-109 victory over the New Orleans Pelicans on Monday night. Ricky Rubio had 20 points and 11 assists, and Rudy Gobert added 19 points and 10 rebounds for the Jazz, who made 14 of 21 3-point attempts and shot 58.4 percent (52 of 89) overall their highest-scoring game this season. Jrue Holiday scored 28 points, and Anthony Davis had 15 points and 11 rebounds for New Orleans, which has lost four of five since losing All-Star center DeMarcus Cousins to a season-ending left Achilles tear on Jan. 26. The Jazz led by double digits most of the way and led by as many as 20 when Rubio’s driving layup made it 116-96 in the middle of the fourth quarter. 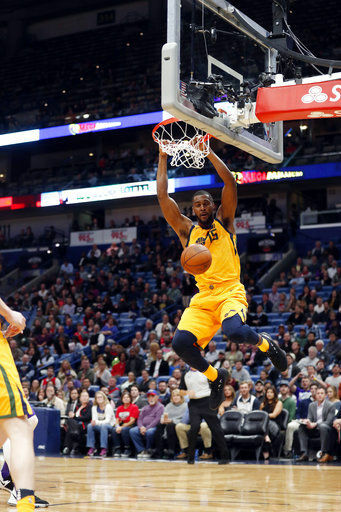 Utah had six players score more than 10, including Derrick Favors with 19, Joe Ingles 18 and Royce O’Neale with 13. Utah took its first double-digit lead less than four minutes into the game and was only briefly threatened after that. The Jazz led by 16 when O’Neale and Rubio hit back-to-back 3s to make it 52-36 early in the second quarter. The Jazz hit 10 of 11 3-point shots in the half, when they shot 61.4 percent overall (27 of 44). New Orleans gave up 70 first-half points, but got back into the game by halftime with a 41-point second quarter. Rajon Rondo hit seven of his first 10 shots, including four of five 3s. His fourth 3 of the half made it 67-64, but Hood hit a double-pump 3 as the second quarter expired to push Utah’s lead back to six. The Jazz then opened the third quarter with 12-2 run, during which Favors scored eight points, and Utah led comfortably from there. Jazz: G Donovan Mitchell, who was listed as questionable with an illness, started just hours after being named a replacement for Orlando Magic forward Aaron Gordon in this month’s All-Star dunk contest. “He’s deserving and I’m sure he’ll enjoy it,” coach Quin Snyder said. Mitchell scored his only points of the game on a one-handed alley-oop dunk in the third quarter. He played 19 minutes. … Snyder said Hood was on minute restrictions, but played him 27 minutes, 11 more than he played Saturday in first game back from his six-game absence. Pelicans: Rondo finished with 18 points. Ian Clark and E’Twaun Moore each scord 14. … C Emeka Okafor, signed Saturday to a 10-day contract, made his Pelicans debut and played in the NBA for the first time since 2013 when he checked in late in the first quarter. He played nine minutes and had three points and two rebounds. … F Nikola Mirotic was making his home debut and first start in what was his second game with the Pelicans since being acquired in a trade with Chicago. He played 33 minutes but scored just five points on 2-of-8 shooting. Jazz: Visit Memphis on Wednesday night. Pelicans: Host Indiana on Wednesday night.